Sometimes people may feel a little uncomfortable when speaking to someone with cerebral palsy because they may not know what to ask or how to ask it. 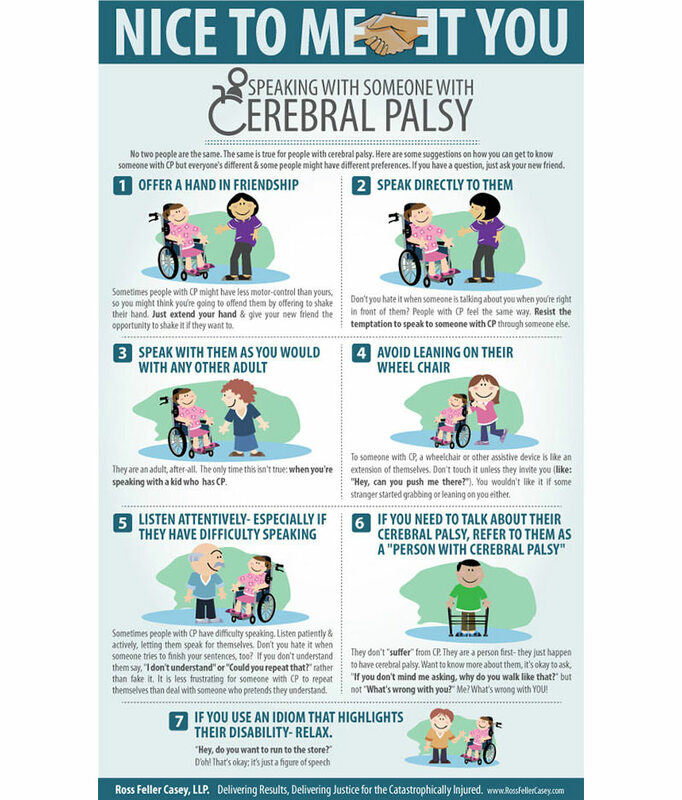 Here are some suggestions that may help someone overcome their hesitations and connect with someone with cerebral palsy. 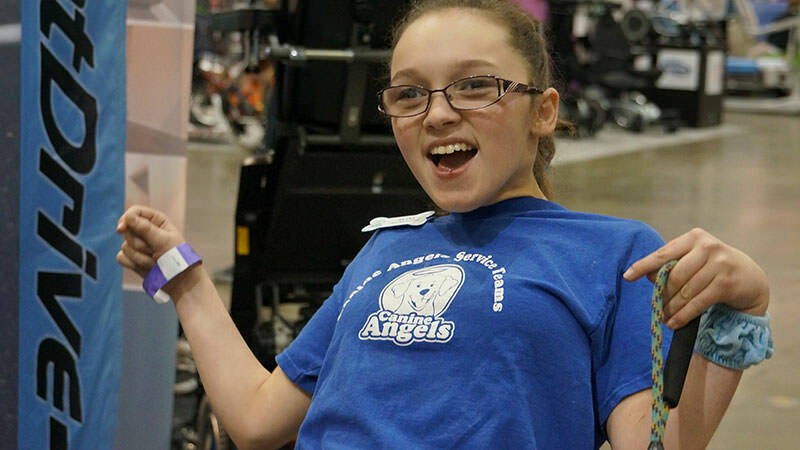 Cerebral palsy affects muscles and a person's ability to control them which means that sometimes people with CP will have less motor control than you. This may make you hesitate when going in to shake hands, but don't. Every good first encounter starts with a good greeting, so offer your hand and give them the chance to shake it if they want. Sometimes people do not feel comfortable asking someone with CP questions they may have, so they tend to ask people around them. Fight the urge to ask others around and just feel comfortable enough to ask them directly; chances are they won't mind answering any questions you may have. Adults with CP are adults, not children, which means you should talk with them the same you would anyone else. Ask them the same questions you would one of your friends; give them the same respect. How would you feel if someone all of a sudden started leaning on you or grabbing onto you? Treat a wheel chair or other assistive device the same way. To someone with CP, a wheelchair is an extension of them and should not be used as a support for anyone else. The only time you should be touching the wheelchair is if you are asked to. Some people with CP may have a harder time when it comes to communication, so it may be a little more difficult to understand what they are saying. The best thing to do if you do not understand is to ask them to repeat what they said, not try to say it for them or pretend like you heard them. They will gladly repeat themselves if you give them the chance. How many times have you been irritated by someone completing all your sentences? Treat someone with CP with the same respect and let them do the talking. If you need to talk about their cerebral palsy, refer to them as a "person with cerebral palsy"
People with CP do not suffer from CP, they just happen to be people with CP. The important thing to remember is they are people first; they are not defined by having CP. Do not rudely ask them questions like "What's wrong with you?" If you want to know more, feel free to ask in a respectful way and you will get the answers you are looking for. People with CP understand that common phrases that may highlight their disability are not used to insult them and will not be offended. If you say something was "a walk in the park" they will not think anything of it other than you using a common phrase that they themselves probably use. The important thing to remember when meeting someone with cerebral palsy is that they should be treated the same way you would treat any of your friends. As long as you show the same respect you would to any other new person you meet then you will have no problem. The Ross Feller Casey law firm is focused on providing help when it comes to personal injury cases. For years, our lawyers have been focusing on birth injuries and helping families get the results they want and deserve.